Yesterday I needed to make a quick gift. 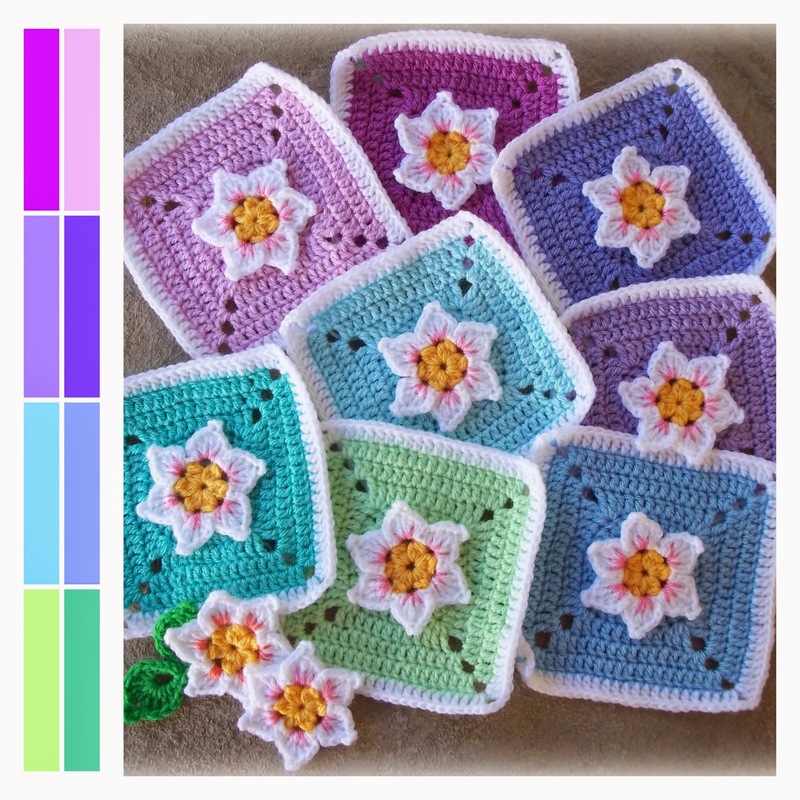 So I chose a few soft colours and hooked up a couple of pretty flower squares to make up something fun! Row 2: Into the same space as the ss, 1ch, 1sc, 4ch; *1sc into top of next cluster, 4ch* *to* 5x (6x four chain loops formed), ss into 1ch at start of row, break off yarn. Row 5: Into same place as ss work 3ch, 1dc into top of next 7 dc (8dc); *2tr, 3ch, 2tr into top of next dc; 1dc into top of each of next 8dc* *to* 3 times; 2tr, 3ch, 2tr into top of last dc; ss into top of 3ch to join. Just looks like spring (although we are quite deep into Autumn here)! In a bit of a crazy rush - so this is not much of a post! Lots and lots of patterns to write and tutorials to do! Gorgeous, thanks for the tutorial. I have plenty of your patterns on my to do list. I think this one just moved to first place. I just finished my last project. Wow! These are so pretty. I love how the flower pops out of the square! Thanks for the pattern. You are very creative! These are so pretty, like you we are entrenched in autumn but still I think I will try them for a cushion for a young girls room. Thanks for sharing. This is so pretty I love it and how you did the the bit of color to the petals. They remind me a bit of the flowers on my grandmas dogwood tree from when I was a little girl... Lonnnnng time ago. :-) Thank you for sharing. Have tried one of the squares looks lovely. Please feel free to accept or ignore. Love this! Would look great for a baby blanket! Thank you so much for sharing this beautiful crochet pattern! My square turned out so beautiful!